The cards challenge this time around on the Create Blog is hexagons - one of my favorite shapes! How to: Punch hexagons from the Printshop! papers by Shanna Noel for Studio Calico then adhere them across a robin's egg blue card base. Drop dark gray spray mist over the top left and bottom right corners. Embellish the hexagons with a badge, wood veneer star and heart, sequins, cork star, and ribbon bow as shown. Adhere an "xoxo" transparency word on the bottom right corner to finish. Beautiful!! LOVING all the hexagons!!!! this soooo rocks!!! I LOVE how fun it is!!! Such a fun card, Paige! 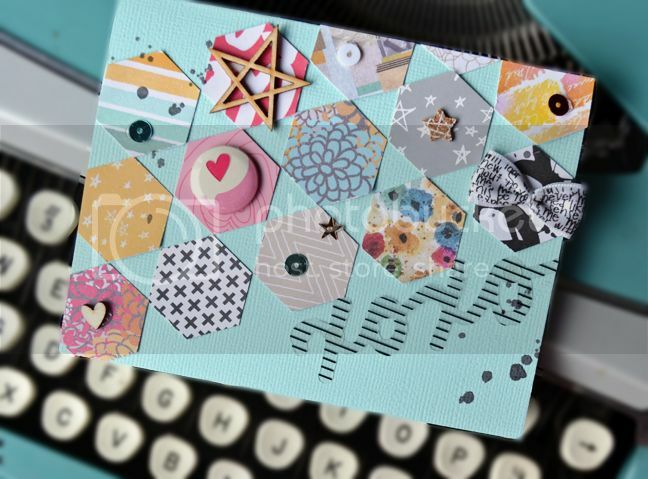 Love how you used the hexagon shapes and great use of the Printshop collection!